His story, he tells me, is not so different from the stories of other veterans who served in Iraq or Afghanistan. He doesn’t know if he can come up with the right words, words that are “profound” enough for the post I’ve asked him to help me write. He knows that talking can unleash a storm of thoughts, feelings, memories and anxiety that take days to settle down. And the last thing he wants is attention for himself. He tells me later that he almost didn’t show. There he is though, a little before noon on a November Friday full of blue skies, rolling surf, and people packing the sidewalks of Ocean Beach. He’s surrounded by shouts, laughter, and the cell-phone chatter of people already giddy about the upcoming weekend. From the outside, he fits right in. Jeans. Black tee-shirt. Sunglasses under the bill of a blue cap with the words “True Religion” sewn in front. Three and a half hours later, I understand that civilian life often seems more foreign to him than Iraq where he served three tours as a Marine. His mission now is to try to live in this world even though he often wishes he could go back. “I’d go in a minute,” he says more than once, looking at me from across the table where we are eating lunch, or at least I am. He has barely touched his salad. He still wears the sunglasses and the hat because the light streaming through the windows can trigger migraines that have gotten worse since the blasts that caused his first concussion. The sense of purpose that got him and his fellow Marines through 18 or 20-hour days on the small base near the Syrian border, is gone. That sense of purpose took root the day he saw the towers fall on television. His life then was just taking shape. He was twenty. He had a steady girlfriend, a job, went to community college. Worked on his Mustang, went to the races at night. As the fallout from 9/11 sank in, he knew he wanted to do his part. In June 2003 he graduated from boot camp at Parris Island. By February 2004 he was in Iraq. That sense of purpose motivated him to want a career with the Marines. It carried him through two more deployments. He carried it with him on 200 patrols, on guard duty, all the jobs he did in addition to his own job as a Supply Administration and Operations Specialist because that is what everyone in his unit did. That sense of purpose kept him and his fellow Marines alert during the crushing hours of boredom that come with every deployment. He held onto it after mortars screamed into two contractor trailers at the wall of the base and fell inches from where he’d been standing moments before. The sense of purpose did not desert him after a rocket propelled grenade knocked him to the ground, or when a female suicide bomber exploded an SUV sending a down a rain of car and body parts onto the base. He was not alone in that purpose. They were also there for each other. 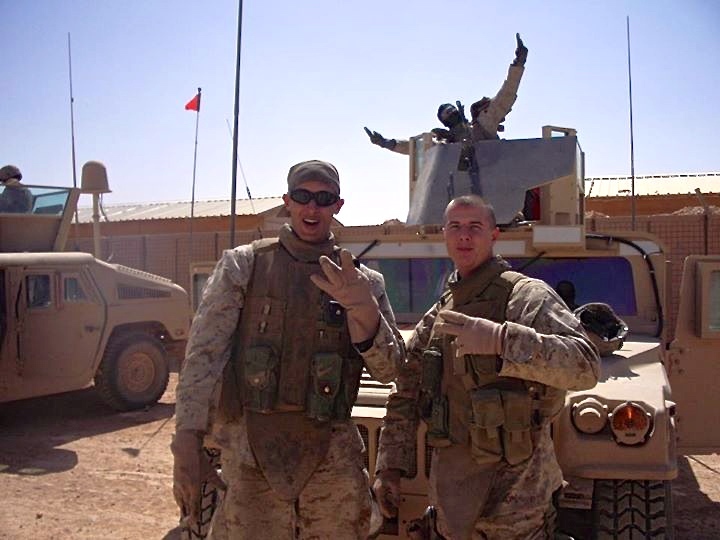 He forged bonds with fellow Marines that he will always feel even though some of them — too many of them — are gone. Around his wrist he wears a black metal band engraved with 8 names. Two died in Iraq, two in Afghanistan. The remaining four — and five whose names are not on the bracelet — died after they got home, where they should have been safe. He “doubled down” – more training. Two deployments back to back. In the space between them, his daughter was conceived. He came home to El Cajon from the last deployment in April 2008, four days before her birth. By then he was a Senior Sergeant stationed in Monterey. As long as he was at work, he could handle things. After hours, the headaches came. The panic attacks. His relationship with his daughter’s mom ended. Then his career with the Marines ended. “There is no instruction manual for coming home,” he says with a sad smile. He struggles with short-term memory loss, the migraines, panic attacks and thoughts that ambush him. If he’s lucky he can sleep four hours a night. He has been diagnosed with PTSD and traumatic brain injury. There are days when he wonders if he will ever feel better. There are days when he thinks about friends who haven’t made it this far. A year ago last month one of his closest friends who served with him committed suicide. She’s one of the reasons he takes a full course load at a nearby college and is working to figure out a career path. She’s the reason he continues to get the help he can from the VA. When he talks about his daughter, his voice steadies and I see a father, a student, a caring human being whose shoulders straighten under his his tee shirt when he talks about the mission he has now. How, I ask, do we get started? Here are three sites that are dedicated to helping Veterans to tell their stories. They offer Veterans the chance to tell their stories in ways they may not have thought of. They offer ways for those of us who have never served to listen, learn, and bridge the distance we imagine exists between us and those who have gone to war. Betsy this is wonderful and so true. I wanted to write something similar but felt I couldn’t because I am still so close to the people whose stories I know now like my own. The media doesn’t get it right – they publish the stories of the grand heroics and of the horrible tragedies and they miss stories like this brave young man’s – the men and women who sign up to defend a country of strangers and put our lives before their own, which is something I will never understand but which I am eternally grateful for. Very thought provoking, you have really got the heart of a challenging issue, and given this young man a voice. Betsy: Dang! I have a lump in my throat I’m fighting back. Such a good piece of writing, clear and poignant and compelling and true! Those guys should be honored every single day. My heart breaks for them and the struggles to get back to “normal” life. Thanks for this Betsy! Proud to know you and can’t wait for your book! beautiful, betsy. and what a caring and dedicated young man he is. i’m so sorry he is struggling so much now, after all he’s given to help others. Betsy, I really like the way you thought this piece through and executed it. I like the way this anonymous soldier’s quotes guide us and you, the writer, through the story. At Half King, a pub in NYC co-owned by Sebastian Junger (author of “War” and maker of the award-wining documentary, “Restrepo,”), soldiers sometimes come and talked about their experiences. I’ve seen how hard it is for them to get the words out, and how people like Sebastian, and now, Betsy, help them tell their stories. Even though it’s very difficult for people with PTSD to talk about what happened and what it’s like to suffer anxieties and panic, talking builds trust and creates connections that are necessary for survival. Not to mention, we as a nation need these stories to begin to understand war and the soldiers who wage war. I love the creativity of this piece and the soldier’s courage to sit and begin to talk about his experiences. His friend’s suicide must be especially difficult to bear. Thank you, Betsy. Betsy, I agree with Rae. The structure of this piece enhanced the storytelling. Lacing his quotes with your observations/summaries/interpretations was the perfect foil. So nice to read this at the end of Veterans Day, a holiday not yet corrupted by the Monday rule. “Just talk like we are people. Isn’t that how everyone should be? Human beings. We’re just trying to make it like everyone else.”……indeed. Others have said it here, but this piece of work, like the Veteran you interviewed, is remarkable. Thank you for spotlighting the ache he feels to be well along side the service he gave and his struggle to adjust to civilian life. Dear Elizabeth, please just keep on doing what you’re doing. Beautiful. Thank you for sharing this man, his words, his life, his mission with us.